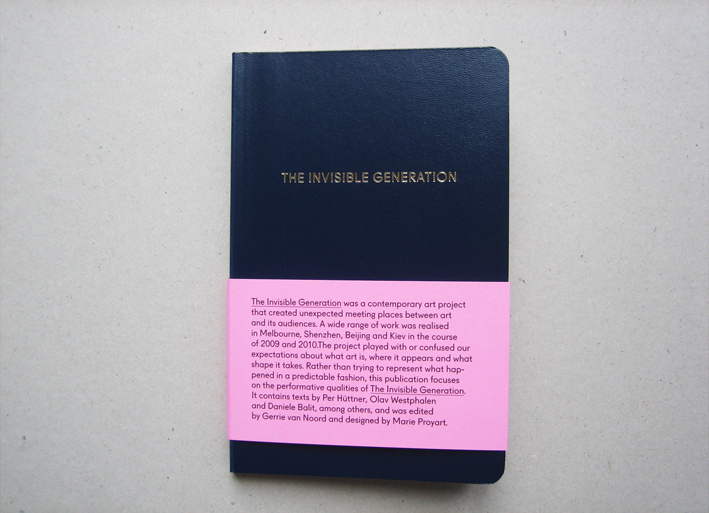 The Invisible Generation is the title of a series of projects that appeared in different guises in the cities of Beijing, Melbourne, Kiev and Shenzhen in 2009–2010, inspired by a text by William S. Burroughs carrying the same title. One of the key premises was to create situations for art and its audiences to meet at unexpected moments, in unexpected places, in unexpected ways. The Invisible Generation was part of Vision Forum and initiated by Per Hüttner and Daniele Balit. The work presented as part of the project often crossed the boundaries between performance, installation, sound, literature and film. In a sense it tried to penetrate the established conventions that dominate these different areas, with the aim of opening up space for alternative and imaginative thinking and dialogues. The locations for The Invisible Generation were carefully selected, based on their relationships to history, or histories, all of which have in recent years embraced change in various ways. The challenges of dealing with the project in the form of a publication were many: neither I, nor the designer, Marie Proyart, had seen any of the performances, or visited any of the cities where the project had manifested itself in one way or another. What we did have was a lot of material: instructions, some of which only existed as text, others having been enacted, or re-enacted; images, some of which giving a direct inkling of what had happened in some place at some moment in time, some of which not saying very much at all, or only in a sequence; descriptions of what had happened in text, some of which very clear, some of which very obtuse, and some reflections on the project’s blog, or verbally conveyed by Daniele and Per. Capturing exactly what had happened would not only be impossible, but to some extent also pointless, as the work had been all about the encounter, in the moment. This led me to suggest to shift the emphasis of what we would try and cover towards the ideas underlying the diverse works, and rather than focus on what they looked like consider where they came from, so to speak. This in turn suggested that Marie and I could take the liberty to actively question and play with issues around mediation and translation instead of trying to ‘solve’ them. Some ‘solutions’, or, in traditional terms, ‘non-solutions’ resulted in quirky elements: there are some blank pages, for instance, for projects where we felt an image would not serve any purpose (Marie’s idea; why didn’t I think of that?!) We embraced actively toying with notions of access by having two different indices and using screenshots of the project’s Wikipage as the introduction (rather than rehashing it into a properly laid out edited text). Per literally pushed me to formulate my thinking around the process by way of contributing a text in three parts. And instead of a traditional blurb printed on the back cover, the book literally wears a description of what to expect on its sleeve; a little band wrapped around itself as object. 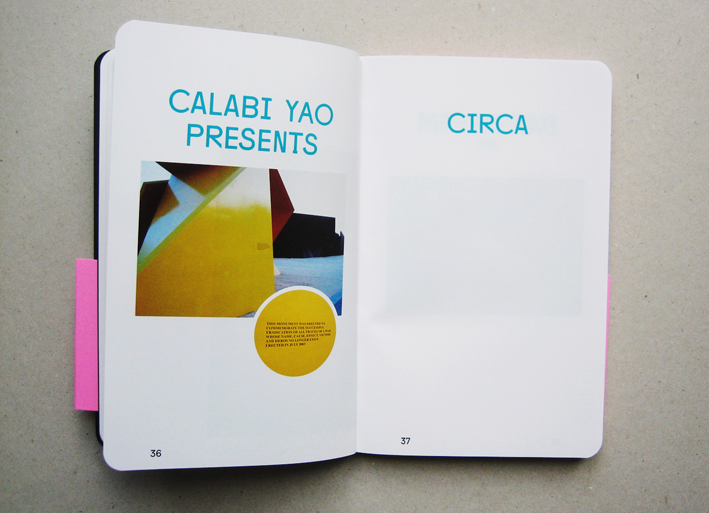 The outcome is maybe an odd little number, that is NOT a catalogue, but tries to allow readers to engage with the ideas behind the individual works and the project overall. With texts by Daniele Balit, Per Hüttner and Olav Westphalen. 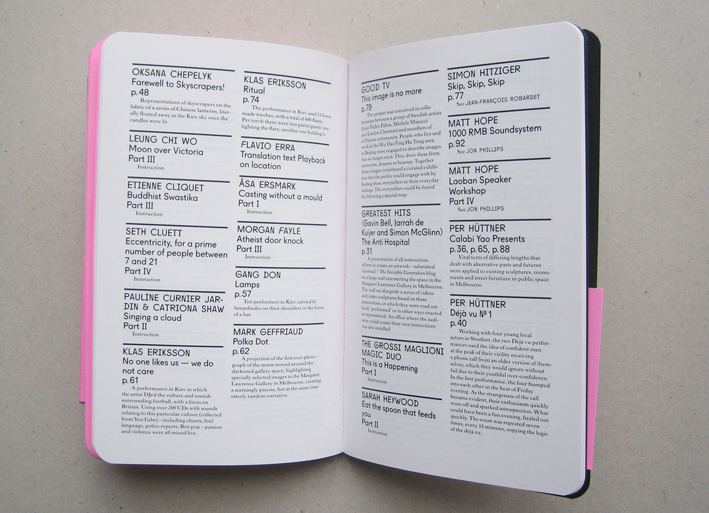 For a full list of all artists involved and how, see The Invisible Generation blog. My own texts can be downloaded TextsTIG. Published by Vision Forum, designed by Marie Proyart.